*Walks on stage to heroes welcome* Thank y'all fo' coming. Werd! I know you be waiting fo' me ta break out mah latest song but first I wanna start the set wif my first #1 rap tune. I wanna innerduce da bruvs. Dis here be DJ R'son Kitty doin' the turntablism and Jamal Jonez be busting some steps. 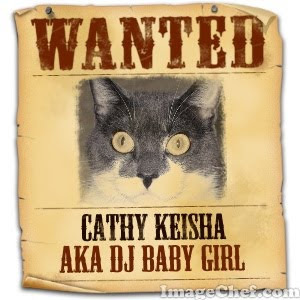 *appaws* I be Cathy Keisha aka DJ Baby Girl. * This be first posted on September 19, 2009. Of course, I KNEW you were a rapper, CK! Brilliant Keisha we were rapping along. Have a fabulous Friday. Pawesome, CK! You rap like a true street kitty. Wow - all that talent hidden in one little Ghetto Kitty! DJ Baby Girl! I love your rap song! livin' the high life up in Traverse City! An arm fo' an arm--I be so DOWN witchoo on dat! Love the rap CK lol! 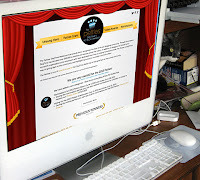 I saw you joined my daughter's blog and I asked her if she noticed she had a new follower. I told her it was "Cathy Keisha a cat from the ghetto"... she said "Oooo!" excitedly and then "What's that?" (referring to the ghetto)... lol anyways that gave me a good laugh. We love da rap and we luvs you cat! That's pawsome CK! You have INSPIRED me! I gotta adapt my OWN rock song! Great song CK. We liked that. Well done. Take care. I'm not gonna mess with you! We're liking you as a rapper!! Yo yo yo, CK. Dat rap be fat! Word! you rap, gurrl, you show dem! Bootiful girl with a bootiful song! You're brilliant, CK. you go girl! No one can lay down a rap like you, CK. Waffles can't understand a word you're meowing...he's a little wet behind the ears. If he's going to be your new *protege* you've got your work cut out for you.